Interested in a compelling book discussion event? 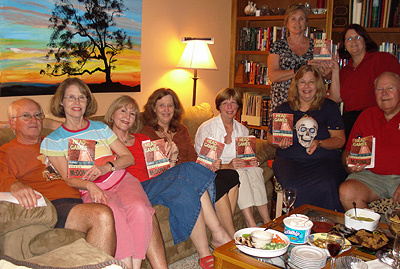 Is your book group reading a Craig McDonald/Hector Lassiter novel? If so, Craig is available to interact with your group via speakerphone. Craig can discuss the intricate shadowplay of fact and fiction that inform the Hector Lassiter novels, the historical characters whose lives cross with that of Hector's, and the secret facts and dark corners of 20th Century history underpinning the novels. Pose whatever questions you have about the books to Craig and be afforded exclusive, preview information about Hector Lassiter's coming adventures. If you send us your photos of your book discussion group with copies of Craig's books, we'll also post them here. To schedule a book group appearance, simply contact Craig. See the first one below! 1. On the first night back from the Mayo Clinicthe eve of his deathErnest Hemingway's last wife, Mary, left keys on a window ledge that afforded Ernest access to guns she's earlier locked away from him. How do you regard this act? 2. When she eventually acknowledged Ernest's death was not the result of a gun cleaning accident as she originally contended, asked to explain allowing Hemingway to get at those fateful keys, Mary said, "Nobody has a right to deny a man access to his possessions." What do you make of her assertion? 3. Many around Hemingway at the end thought his obsession with FBI spying was a symptom of his increasing mental illness. We now know the FBI was monitoring Hemingway and followed him into the Mayo Clinic. Do you think it possible Hemingway was more rational than friends and family believed him to be? 4. It is argued in Print the Legend that authors and their critics/scholars have a symbiotic relationship. Do you think authors bend or shape their works in ways that court such academic attention? 5. This is the third novel in the Hector Lassiter series. Did this book change your opinion or view of Hector in any way? 6. Did any of Hector's actions or choices in Print the Legend particularly surprise you? 7. Confronted with an alternative explanation for Hemingway's death, Hector argues the publicly accepted account of Hem's suicide should stand. Do you share his opinion? 8. What are your thoughts about Hannah's eventual decision spinning out of her perception of the "true" circumstances of Hem's death? 9. The closing pages of Print the Legend would appear to contradict the conclusion of the first Hector Lassiter novel, Head Games. What do you make of this contradiction? 10. Which conclusionHector's ultimate fate as explained in Head Games, or the version in Print the Legenddo you prefer? 11. If you accept Print the Legend's implications regarding Hector's fate, what do you think became of Hector after 1967? 12. How did your attitude toward Hannah change over the course of the novel? 13. In addition to Hemingway, the FBI also kept extensive files on Carl Sandburg, John Steinbeck, Rex Stout, Tennessee Williams and Norman Mailer, among many others. Do you think its possible similar files are maintained on contemporary authors? 14. Hector is known as "the man who lives what he writes and writes what he lives." He remembers his ex-wife Duff insisting he'd some day have to choose one side of that equation: either his life informs his art, or his art shapes his daily existence. Do you agree with her assertion that Hector can't have it both ways? 15. The fourth Hector Lassiter novel is Roll the Credits, detailing Hector's storied activities in-and-around the Second World War. Any suspicions about what might happen in that installment? 1. The first Hector Lassiter novel, Head Games, was narrated by Hector. Toros & Torsos is presented in third-person point of view. Why do you think this narrative perspective was employed in this second book of the series? How did the switch in voice affect your attitude toward Hector? 2. The tension between politics and art is a major theme of Toros & Torsos. Hector persistently claims to "have no politics" yet repeatedly functions as a kind of intelligence gatherer for the FBI and other intelligence agencies. Do you believe Hector's assertion that he is apolitical? If not, what nature do you think Hector's politics assume? 3. Do you agree with Hector's assertion that the insertion of topical politics or political commentary in popular fiction mars a novel? 4. Hector served in the Punitive Expedition chasing Pancho Villa; he was an armed combatant in World War I and willingly went to Spain during that country's Civil War. Head Games established that Hector participated in World War II as a correspondent and ran afoul of authorities for perhaps functioning as a guerilla leader against the Nazis while ostensibly serving as a reporter. Hector consistently criticizes war and armed combat, yet returns time and again to theaters of war. Why do you think Hector does this? 5. In book one of Toros & Torsos, set in 1935 Key West, we observe the run-up toand aftermath ofa hurricane that remains the most destructive and powerful tropical disturbance to strike the United States. Ernest Hemingway was outraged by the federal government's handling of the evacuations prior to the Labor Day weekend storm and the resulting deaths that he attributed to the Roosevelt administration. From a modern, post-Katrina perspective, are you surprised a similar event could have unfolded in the manner of the Key West disaster and not prompt changes that might have altered the outcome of the storm that more recently struck New Orleans and Mississippi? 6. Mulling the ramifications of the psychological torture employing surrealist art motifs in Spain, Hemingway says, "Rules in war are a joke... When you're in a war, there's only one thing to dowin...any way you can. All the rest is...salve for the conscience." Do you agree with Hem's assertion? 7. The concluding chapters of Toros & Torsos finds Hector finally confronting the original "surrealist killer." Do you agree with Hector's decision regarding the fate of the murderer? What do you make of Hector's long, unusual association with the killer? 8. Did you solve the identity of the killer prior to Book 3 ("Film Noir")? If so, what tipped you to the identity of the murderer? 9. Hemingway, although not an "on-the-page" character in Head Games, loomed over the first Hector Lassiter novel. Having directly experienced the arc of the Hemingway-Lassiter friendship in T&T, did anything surprise you? 10. If you have read Head Games, did anything in T&T force you to revise your opinion of Hector's character? How do your reactions to Hector vary between HG and T&T? 11. Hector comes to rue a phrase he is confronted with several times in the course of the novel: "The man who writes what he lives and lives what he writes." Do you agree with this assessment of Hector's character, or does it seem an over-simplification? 12. The next book in the Hector Lassiter saga is entitled Print the Legend. That novel finds Hector Lassiter traveling to Ketchum, Idaho in 1965 to poke around the circumstances of Ernest Hemingway's "suicide." Mary Hemingway is a major character in the book. Do you expect any further revelations in terms of the Hemingway-Lassiter friendship in that novel? If so, what form do you think they may assume? 1. Hector Lassiter, narrator of Head Games, is himself a fiction writer. How credible does that make much of what Hector is relating to the reader in the narrative? Is it possible, as a fiction writer handing down a supposed memoir, Hector might knowingly make himself "unreliable" in a literary or factual sense? 2. Rodolfo Fierro, Emil Holmdahl, Orson Welles and Marlene Dietrich are all historical figures. Do Hector Lassiter and Bud Fiske remind you of particular historical figures or real personalities? If so, whom? 3. Hector seems to regard himself as a maverick and a kind of loner. Yet's he's been married several times, and apparently sees in Alicia and her toddler daughter a chance to recover the family life he's recently lost. What is your sense of Hector and his notions of family and marriage? 4. It's been said those who forget the past are condemned to repeat it. How does the attack on Columbus, New Mexico by Pancho Villa and the resulting "Punitive Expedition" to capture Villa in the deserts of Mexico compare/contrast to the terrorist attacks of September 11, 2001, and the ensuing hunt for Bin Laden? 5. How does the character "George W's" remarks about the Punitive Expedition and the resulting theft of the head of someone other than Pancho Villa's compare/contrast with George W. Bush's invasion of Iraq in the wake of 9-11? 6. "George W." appears to disdain the timeworn rituals and secrecy shrouding Skull and Bones, and he seems highly critical of his own father and grandfather. How would you characterize George W.? Heroic? Naive? Misguided? Or something else? 7. Hector has been called "the man who lives what he writes and writes what he lives." He tells Bud Fiske writers "have to try to live in every momentSumand then live to write about it." How much of what you read in a novel do you presume to be drawn from its author's own experience?" 8. Bud asks Hector, "Do you deliberately make a mess of your life just to keep yourself interested?" How much of Hector's grief do you think is self-inflicted? Do you sense Hector courts disaster in an effort to generate source material for his novels? 9. Is Hector a heroic figure? A tragic character? Do you have some notion apart from those two extremes in terms of the kind of man Hector might be? 10. Bud Fiske, Hector's young sidekick, assumes narrative responsibilities in the last third of Head Games. What do you think is the state of Hector and his relationship to Bud as the book concludes? What form do you think the concluding dialogue between Bud and Hector assumes? 11. The novel concludes in 1970. How would you characterize the effect Hector has had on Bud's life since 1957? On Alicia's life? 12. Head Games has been released as "the first Hector Lassiter novel." Having read the book, what do you anticipate in terms of future installments in the series?